The lighting and setup here aren't exactly brilliant by any standards, but I figured I'd give it a try. LOL, got your priorities straight...eat garbage but have tons of photo equipment! 6 for humour. 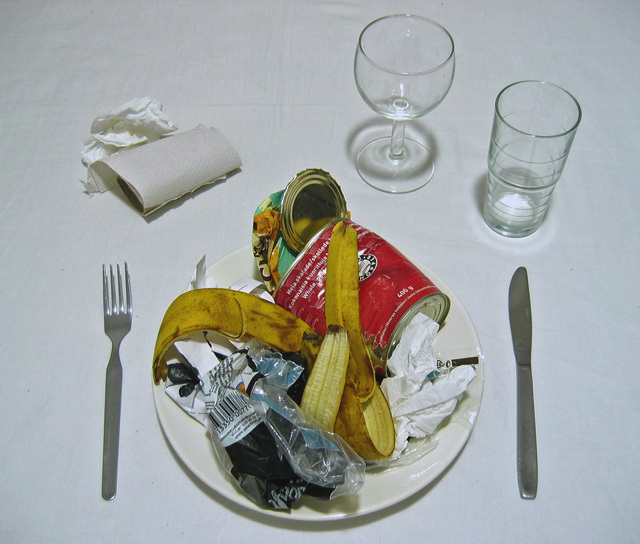 Looks more like garbage on a plate than junk food. This composition doesn't work for me. ha! like the concept! not so thrilled by the all white background...it dilutes the impact of the garbage plate in my eye (not as vivid as i'd like to see). Yum, I'm hungry! Like the toilet paper roll and used Kleenex for the (I guess) table napkin. High score for being on topic, yet humorously leaving a message. LOL! Fresh idea! I like it but next time don't use direct flash. I like the idea, although the lighting is a little too harsh perhaps. Proudly hosted by Sargasso Networks. Current Server Time: 04/24/2019 03:50:38 AM EDT.